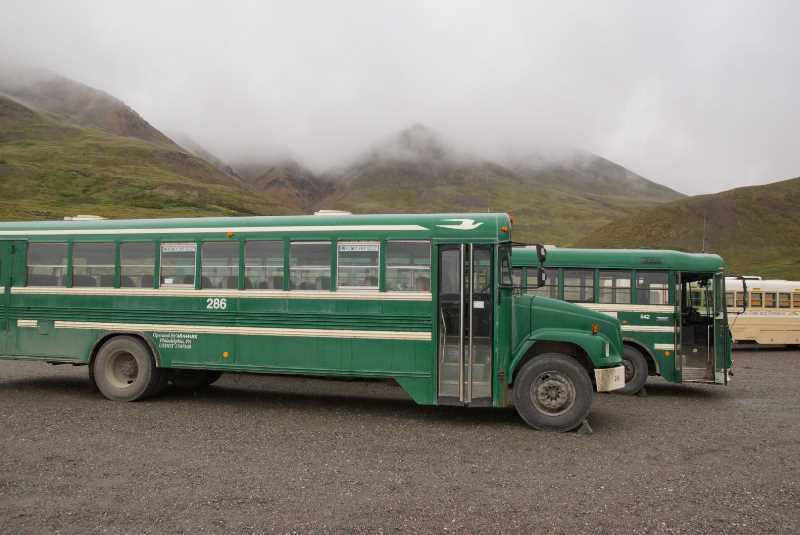 At mile 66 on Denali’s park road, Eielson Visitor Center provides a worthwhile destination for shuttle bus passengers. On a clear day, you will have a stunning view of Mount McKinley, a.k.a. Denali, which is just 33 miles away. (In the photo above, I added an outline that roughly shows where the mountain would be on a clear day. I can’t guarantee accuracy.) In addition, there are a couple of enjoyable trails that are worth hiking here. And, the visitor center itself is excellent. 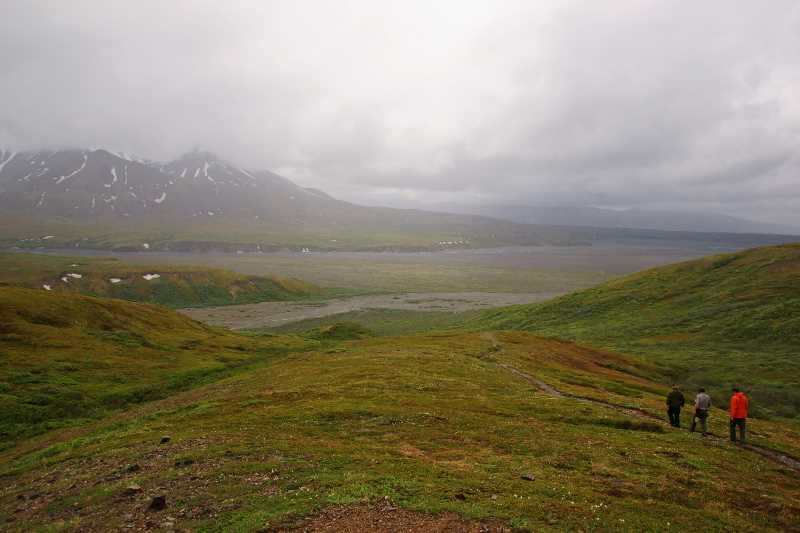 When I arrived at Eielson, I didn’t care about the view, or hiking, or anything else. I was exhausted and car-sick from the long, warm, jostling bus ride. It had taken more than three hours to travel 66 miles, with only a handful of all-too-brief rest stops along the way. I was glad I wasn’t going any further. I walked into the visitor center with just one thing in mind: I needed to find a quiet corner, where I could curl up in a ball for a while. And that’s exactly what I did. I’m not sure how long I napped. Maybe an hour. When I awoke, I ate a snack from my backpack and walked around a bit. Eventually, I started feeling human again. 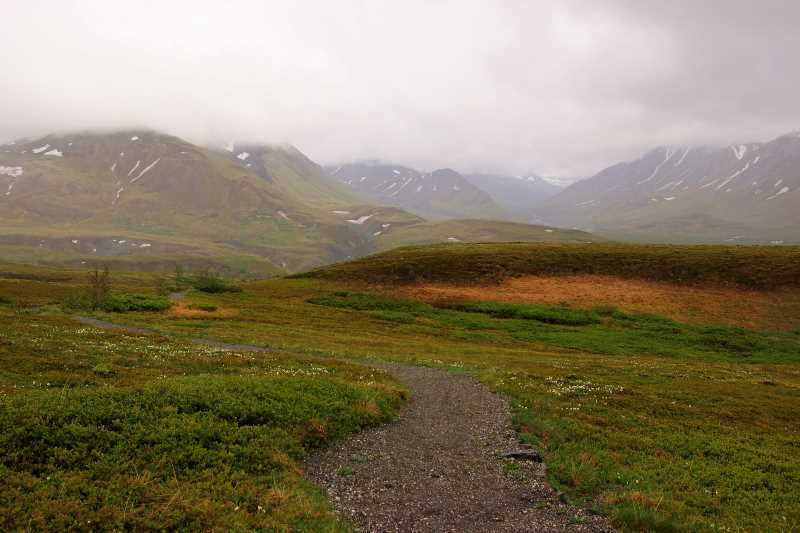 Eielson offers two developed hiking trails. One goes downhill from the visitor center, the other goes uphill — quite a bit uphill. I sampled the more difficult of the two trails first: the Alpine Trail, to Thorofare Ridge. And just to be clear, I did not go all the way up to Thorofare Ridge. 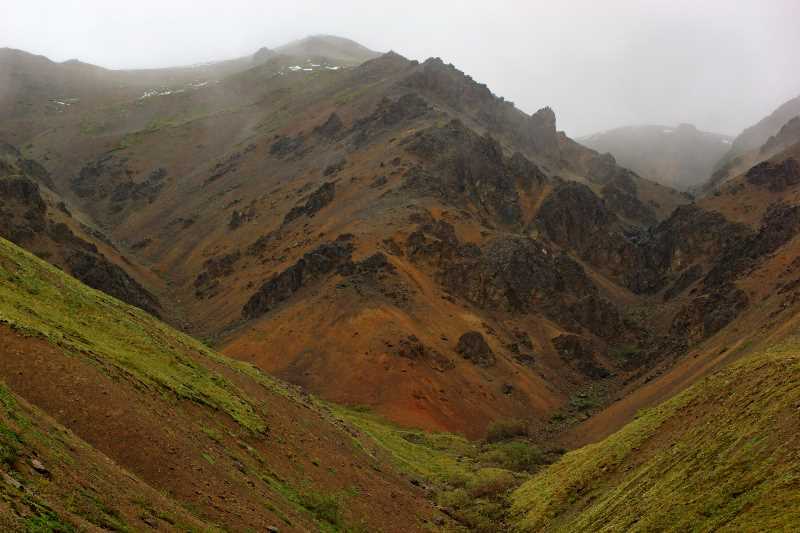 That hike requires a 1,000-foot elevation gain in just one mile. That’s a pretty brutal climb, and I was still somewhat shaky. Not to mention, it was drizzling and foggy, and there were no great views of Denali to be seen. On a clearer day, I’m sure the view from the top would be spectacular. Just a short hike up the trail, though, reveals a nice view of the park road. 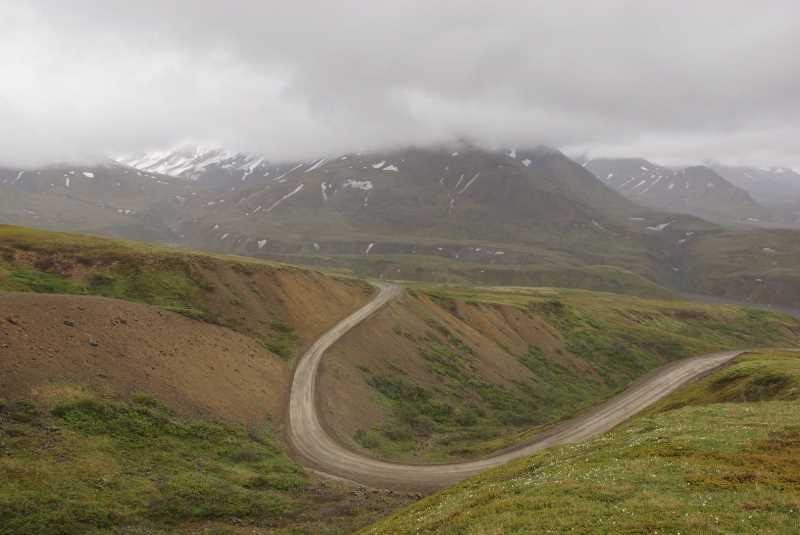 This stretch is just before you arrive at Eielson. The entire panorama is pretty spectacular. 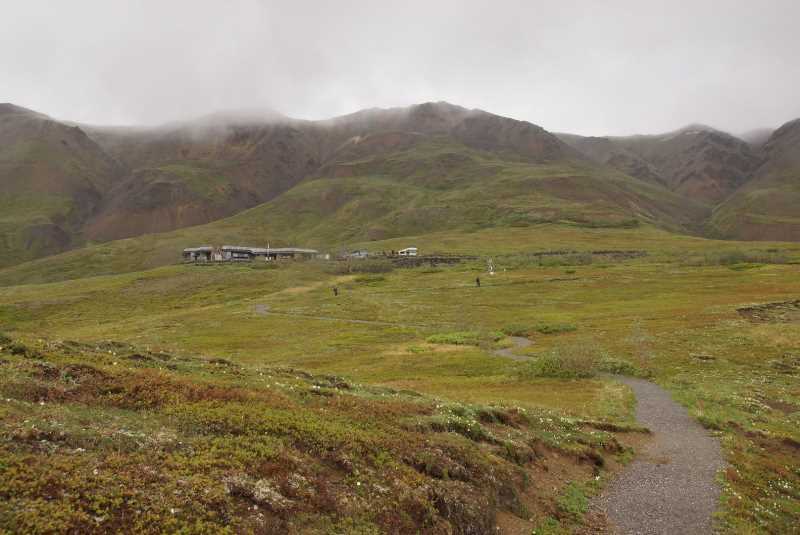 … past the visitor center, and on to the Tundra Loop. This simple trail is 1/3 of a mile, round-trip, plus a side trail that adds another half-mile, out-and-back. Just imagine The Big One standing behind all those clouds! The view is beautiful, even on a cloudy day. This trail does lose some elevation, which you have to regain to return to the visitor center. That’s Eielson, just up the hill. Back at the buses, I checked to see how long it would be before the next bus departs. I had about 45 minutes to wait, but I didn’t want to spend that time sitting around. I had already done enough of that at Eielson. I was ready to do more, and I certainly wasn’t looking forward to spending more time on a bus. So, I started walking the road, and caught the bus when it drove by. You can check out that part of my lonely adventure on the park road, here.